They called Anthony Pettis “Showtime” before he ever stepped foot in the cage on Thursday night, but never before has a fighter earned a nickname like he did on his way to winning the last ever WEC lightweight title and a shot against the winner of Frankie Edgar vs. Gray Maynard. 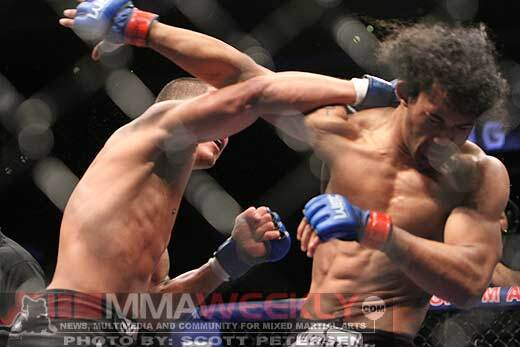 Stepping into opponent Ben Henderson’s adopted home state, Pettis knew he’d have the crowd against him, but for a young man that has endured so much in his 23-years, a disapproving audience could never rattle him. 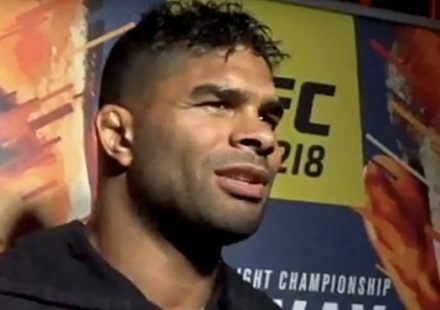 The Milwaukee based fighter came into Thursday night on a three fight win streak and showed the moxy of a grizzled veteran, stalking down the champion throughout their five round war. Henderson looked solid throughout the fight as well, landing a few takedowns and hitting some nasty body kicks. 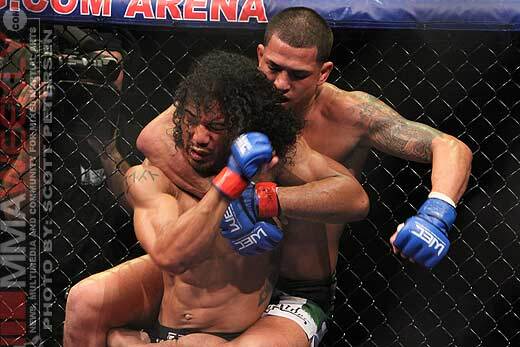 The 4th round saw the champion nearly get a finish as he took Pettis down and got his back. With a forearm slipped under his opponent’s chin, it looked like Henderson was going to get yet another win, but somehow, someway, Pettis got out and reversed positions to get out of the bad spot. As Henderson backed away across the mat, Pettis ran forward and with a leap and a kick off the cage jumped through the air like he was Spider-Man and clipped the champion with a kick flush across the face. Henderson fell flat on his back and Pettis rushed in to hammer his opponent looking for the finish. A stunned crowd could only react as their hometown fighter fell, but the gasp was caused from the moves of Anthony Pettis, who surely sealed up his win with the ninja like acrobatics. As the final horn sounded, Pettis threw his hands up as if he knew what the judges were going to say, and he was right. A few moments later Bruce Buffer announced Pettis as the last ever WEC lightweight champion, winning by unanimous decision, and now securing his spot as the top contender in the UFC’s 155lb division. The kick seen round the world was the topic of discussion for everyone tonight, and Pettis admitted that it’s something he practices and his coach even encourages. Oh yeah, Pettis also says he has a few more tricks up his sleeve. “Duke Roufus we practice that all the time, just to have fun in the cage, that dude’s the man. 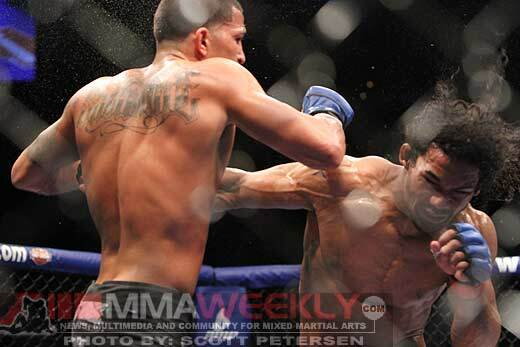 I’ve got 10 more of them kicks coming, but I’m going to do them in the UFC,” a confident Pettis said after the win. A somewhat dejected Ben Henderson stuck around to greet his audience in Arizona, and the champion fought valiantly and had nothing to be ashamed of after his performance. “Pettis did a good job, the judges gave it to him, he did a good job,” Henderson said after only the second loss of his pro career. Henderson’s career will undoubtedly continue in the UFC, but for now it’s Anthony Pettis’ moment in the sun. The kid who dreamed of fighting for the gold now wears it proudly around his waist, and will likely sit front and center at UFC 125 to watch Frankie Edgar take on Gray Maynard. Edgar and Maynard take notice….Showtime has arrived.